This card cannot be Normal Summoned or Set. This card cannot be Special Summoned except by Tributing 1 "Red-Eyes B Dragon" on your side of the field. Increase the ATK of this card by 300 points for each Dragon-Type monster in your Graveyard. Coin Flip I'm disappointed at this. I think I said way back when we reviewed Red Eyes B. Chick that the support for certain normal monsters was pathetic at best (with the exception of BEWD and Dark Magician, it barely exists at all). That said, it's a fairly decent card. Lord knows Dark Paladin has a much better effect, a MUCH better boost, better stats, and is several times cooler than this dude, but that doesn't stop REDD from being cool. Usually his attack will not be under 3000 when you first summon him, thanks to REBChick and REBDragon. So yeah, he is pretty damn good in that regard. Oh, Chaos Necromancer and Gren Maju Da Eiza are both better than this guy in attack boosts. People have summoned Chaos Necromancer at 9000+ attack, and Gren Maju Da Eiza is usually 3000+ when I see it summoned. Protection should be unnecessary for this card, as the game should end as soon as you pull out a 3000+ monster. We start off the week with the Ultra Rares from the new Structure Decks, and today’s is Red-Eyes Darkness Dragon. REDD isn’t the worst card in the game, though I wouldn’t exactly call him game-breaking. 2400 ATK with the requirement of tributing a Red-Eyes isn’t really worth it, and he doesn’t give you that much advantage. It’s interesting to note that he has 9 stars, however, which makes him capable of Morphing into Master of Oz. REDD is a nomi monster – you can never Special Summon him any way except for the one written on the card. But his requirement isn’t that difficult to fulfill (though it is extremely inconvenient). Getting REBD out is easier than ever, thanks to Red-Eyes B. Chick. In fact, thanks to REBC, it’s possible to get REDD out on your first turn, with a nice 3000 ATK (because of his 300 boost for each Dragon in your Graveyard). If you toss in some Inferno Fire Blasts while you still have REBD on the field, that isn’t too bad at all. But is he worth it? I really wouldn’t say so. Unless you have a Deck focused around getting insane numbers of Dragons into your Graveyard (via Painful Choice, Troop Dragons or what have you), feel like being rentsy or are a die-hard Red Eyes fan, I wouldn’t use REDD in competitive play. His mediocre effect just doesn’t make up for his relatively difficult summon requirement. Welcome to Mystery Week! What does that mean you ask? Well, at the time that I’m typing this I have no idea what cards are to be reviewed Wednesday-Friday, but I don’t need to worry about that for a few days. Today and tomorrow we’ll be reviewing the new Structure Deck cards, followed by some ____________ cards. Today’s card is Red-Eyes Darkness Dragon, a monster I can already tell I don’t care for. Red-Eyes Darkness Dragon is basically a mirror image of Red-Eyes B(lack) Dragon; it’s a Dragon with 2400 ATK giving it some decent Dragon support at the price of a lackluster ATK. Now while Black Dragon got 0 points for stats, Darkness Dragon gets some credit in this area merely because it’s a Special Summon only monster, meaning you don’t need to waste a summon on this monstrosity of a monster; or do you? Darkness Dragon is one of the infamous “Nomi” monsters, meaning there is only one way to summon it. That method is by Tributing a Black Dragon that is under your control. Now as you may be aware, I’m not incredibly fond of cards that can only be used with 2-3 other cards. This leads to my immense “love” of Darkness Dragon. Now there are of course relatively easy ways to summon Black Dragon in the forms of Red-Eyes B(lack) Chick, Double Coston, and The Flute of Summoning Dragon, so Darkness Dragon is one of the easier to summon “Nomi” monsters. However, that doesn’t make it a monster you’ll be getting out on your second turn frequently. Summoning restrictions aside, Darkness Dragon has an okay-added effect; for each Dragon in your Graveyard, Darkness Dragon’s ATK increases by 300. The effect has potential; I imagine in a good Dragon Deck you could get Darkness Dragon’s ATK up to 3900 after a few turns, making it a fairly good beatstick. 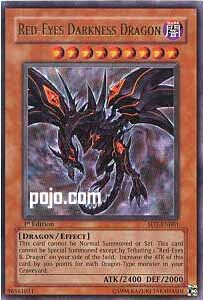 Darkness Dragon is obviously restricted to only being used in a Red-Eyes Black Dragon Decks, where I’m sure it could be of some use. Just make sure it can stay on the field for a while and you’ll be fine. Advanced Format (Red-Eyes Deck): 3/5. If you want to use it, make sure to run a lot of Dragons so that you can take advantage of the ATK boost. Traditional Format (Red-Eyes Deck): 3/5. If you want to use it, make sure to run a lot of Dragons so that you can take advantage of the ATK boost. Art: 4/5. It’s basically a Black Dragon without any “arms”. Welcome to Structure Deck Week! There's not much new happening until Flaming Eternity or Dark Revelations comes out, so something had to be reviewed to cover the time. This week, I chose either new cards from the Structure decks or cards in the Structures that stand out. In my opinion, Red-Eyes Darkness Dragon is one of those cards made just for newbies -- I call this a "newbie trap". The deck is exactly at 40 cards, so in order to remove this card, the player would have to add something else. Most of the time, the newbie won't do that and will play the deck as is -- or add that deck to 80 other random cards they happen to have. Basically, you'r giving up a card in hand and a 2400 ATKer on the field to get a minimum 2700 monster (the REBD you sent to the graveyard gives REDD +300, along with any other monsters in your graveyard). This could be considered a combo with recursion, as once you have the REBD in the Graveyard, you can revive it easily...but on the same note, we have Painful Choice for that already...and enough other ways to get your REBD killed besides you doing it yourself. Speaking of recursion, you can't bring this card back -- it's a "nomi" (Only) monster, which means it can ONLY be Special Summoned that one way. This week brings us a few overlooked cards and two brand new cards from the structure decks. Today is a special treat, Red Eyes Darkness Dragon! And while the card art for this is fantastic, the effect does not quite match up. This is what I'd like to call an "Anti-Raigeki" card, where the activation cost of the card becomes so ludicrous; it enters the hazy zone of tournament pack card playability. I realize, by naming this card so, I'm doing injustice to that fabulous starter deck super rare, Gryphon Wing, but all this really means is that Red Eyes Darkness Dragon is garbage. See, upon careful examination, we begin to realize that both Vampire Genesis and Red Eyes Darkness Dragon are extremely difficult to summon. Not impossible, i.e Gate Guardian, but extremely difficult. This one, in particular, requires a deck fully dedicated to Mystic Tomato searching out Red Eyes B. Chick, which in turn summons Red Eyes Black Dragon, which then finally begets Red Eyes Darkness Dragon (hopefully). If this sounds like a three card combo to you, it should, because it is. This, of course, doesn't mention the fact that the summoning of any of the components can be easily owned by Torrential Tribute, Ring of Destruction, and so on and so forth. Then, throw upon the heap of combustible garbage the fact that Red Eyes Darkness Dragon has a terrible effect, and you begin to see where I'm going. Now how many will you run in your deck? This suffers from a classic case of "it needs to be consistently drawn, but it's consistently terrible." Cards like Raigeki Break, Divine Wrath, Solemn Judgement, and other such cards fit into this category, albeit to a far lesser extent. If you run 1, you'll never get it summoned. If you run 2 or 3, they'll be dead weight nearly 80% of the time, so you hurt the entire deck by even attempting to run this bad boy. Let's just go on with the review, shall we? Advantage F/H: A Red Eyes B. Chick and a Red Eyes Black Dragon will be in the graveyard, giving it 3000 ATK upon summon. Let's compare alternatives. Dark Paladin costs three resources (King of the Swamp + Fusion Sub/Polymerization + Dark Magician/Buster Blader), comes roaring out of the gate with Spell negation and at least 2900 attack. Horus LV 8 comes roaring out of the gate with Spell negation, 3000 attack, and costs three resources (Horus LV 6, Horus tribute/Call/Premature, Level Up!). Blue Eyes White Dragon comes out of the gate with 3000 attack, often for one or two resources, but at the maximum of three (Blue Eyes+ 2 Tributes). And it's not dead weight nearly as much as this one! So while this card may provide some sort of advantage, it also costs three cards AND is 80% of the time dead weight. The advantage is not nearly enough. Attributes/Effect: This card costs three resources minimum to summon and has one of the nastiest effects for a two tribute monster in existence. The effect doesn't even push this card into the 4000's! Worthless. Dependability: Nope, this would warrant another ellipsis, but that's already been used up under the Best Draw portion. The Bottom Line: You're not getting the structure decks for this bad boy now, are you?